ILLINOIS — A New Jersey-based company this week issued a nationwide recall of liquid medicine used as an infant pain reliever and fever reducer and sold at Walmart, CVS and Family Dollar. 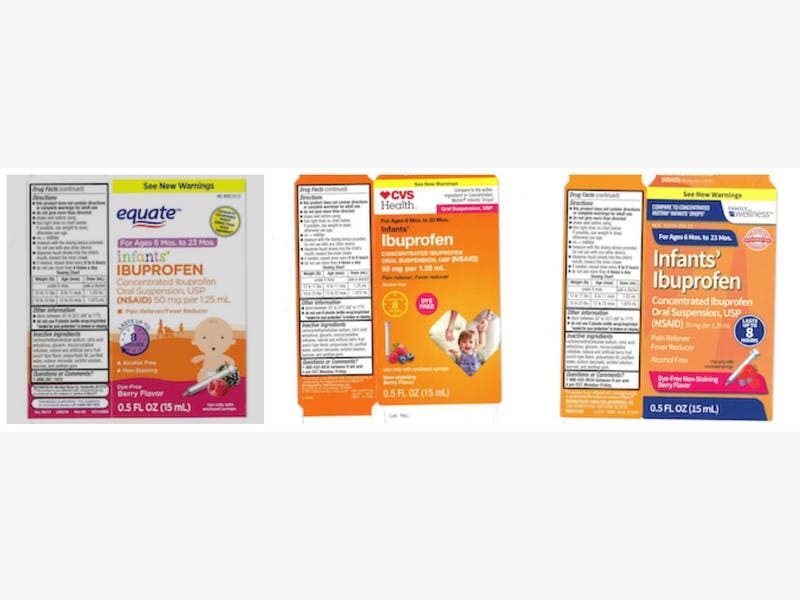 Tris Pharma has voluntarily recalled three lots of Infants’ Ibuprofen Concentrated Oral Suspension sold under the brands Equate (Walmart), Family Wellness (Family Dollar) and CVS Health because of potentially high levels of concentrations of the drug. In a press release, company said there is a remote possibility that infants may be more susceptible to a higher potency level of drug, and therefore may be more vulnerable to permanent renal injury. Adverse effects that may be experienced are nausea, vomiting, epigastric pain or, more rarely, diarrhea. Tinnitus, headache and gastrointestinal bleeding are also possible adverse effects, according to the release.